Container gardens have been around for hundreds of years. Within the last decade or so, there has been increased interest. Because cacti and succulents are often grown in containers, here are some reviews of books that will be helpful. “Plants in Pots” by Andi Clevely features exquisite color photos by Mark Bolton. This hardcover was released by Frances Lincoln. It takes all of the guesswork out of container gardening. An entire chapter is devoted to choosing suitable plants. This also covers gravel, stone, and other mulches for pots. In this enlightening book, you’ll find all sorts of stylish ways for displaying and growing cacti and succulents throughout the landscape. This has lots of ideas for everything from roof and balcony gardens to sink gardens, flower boxes, and hanging baskets. Many of the featured pots contain cacti and succulents. This title emphasizes the need to select the most appropriate plants for various situations and areas in the landscape. There are lists of plants for various kinds of container gardens. The author emphasizes proper plant care. This explains how to choose potting mix and how to repot. It also covers plant support, grooming, watering, and fertilizing. Readers will also learn how to cope with pests and other problems. Throughout the book are boxes with quick tips. “Containers with Style-Do it Now Do It Fast Do It Right” was released by Taunton Press. It features ten delightful container garden projects. 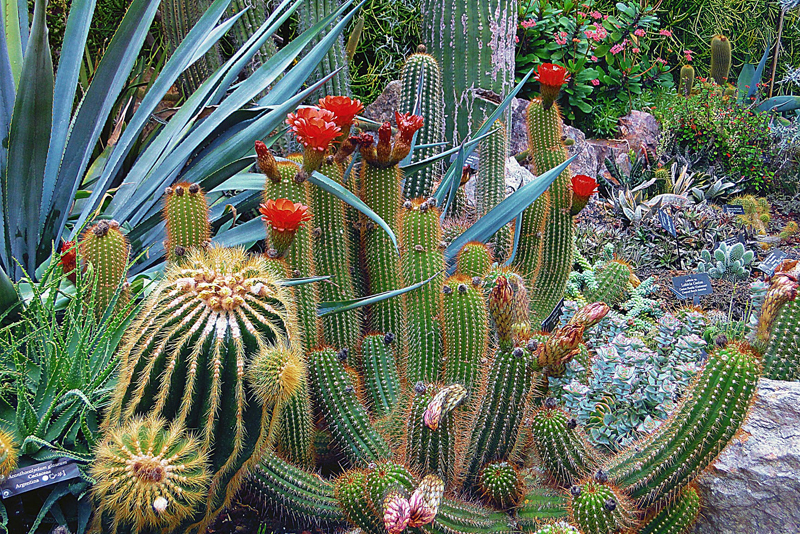 Some of these will have special appeal to cacti and succulent growers. These projects include a hypertufa planter as well as strawberry pots, window boxes, and a planter box on wheels. The moss lined basket would be perfect for moss rose and other succulents with cascading stems. The multi-tier plant stand is perfect for displaying collections of cacti and succulents. Readers can also learn how to turn a plain pot into a stylish container garden by decorating it with paint, shells, or mosaics. Some of the projects do require some degree of do-it-yourself skills, such as carpentry. For each project, this has a list of the supplies you’ll need, and step by step, color illustrated directions. Sidebars contain troubleshooting tips and additional information. Content copyright © 2018 by Connie Krochmal . All rights reserved. This content was written by Connie Krochmal . If you wish to use this content in any manner, you need written permission. Contact BellaOnline Administration for details. A place where cactu and succulent lovers share experiences and ideas. Subscribe for free weekly updates from this Cacti and Succulents site.